On most Sundays in winter you will find a pot of soup simmering on our stove. A big batch of healthy vegetable based soup lasts all week for me and provides quick healthy go-to lunches and even snacks. 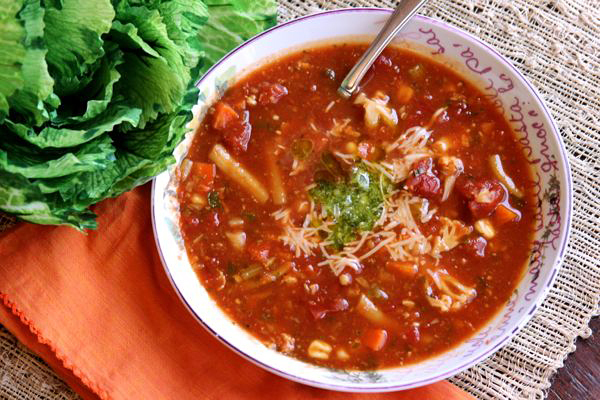 After enjoying a bowl of Panera’s Garden Vegetable soup I was intent on using it as my inspiration to create a great vegetable soup at home. Since I am preparing this in the middle of a Michigan winter, the availability of fresh ingredients is a little more limited. Certainly use fresh if able. You can also adjust the kind of vegetables added as any combination will do. You could also add 1/3 cup of barley or small semolina pasta to make it a little more hearty. I prefer it to be pure veggie packed. This recipe can be prepared as written or even in a slow cooker. If using a slow cooker simply toss ingredients in and cook on low for 6 hours. The basil pesto is not necessary but I encourage you to use it as it certainly provides the perfect finish. The ingredient list sort of speaks for itself – a pot full of vegetables = a pot full of nutrition goodness. Packed with vitamins, minerals, antioxidants soluble and insoluble fiber. Combine the vegetable stock, water and tomato puree in a large soup pot. Mix until puree is blended in. Add remaining ingredients and bring the soup to a boil. Reduce heat to simmer and cook uncovered for 25 - 30 minutes, adding an additional 1/2 cup water if needed. Take a taste and season accordingly. Delicious served straight from the pot or enjoyed over several days.